Situated between the Covent Garden Market and the Strand, Maiden Lane was originally a path running along the southern edge of the ‘Covent Garden’: that is, the Convent Garden, belonging to the Benedictine monks of Westminster Abbey, and providing produce for their table. The lane was blocked at the eastern end by a great statue of Our Lady (some say this is how the Lane got its name) but unblocked in 1857 by Royal Decree of Queen Victoria. Queen Victoria didn’t take kindly to her carriage having to negotiate a three-point turn on her way from a favourite haunt of the Adelphi Theatre. A less pleasant explanation for the name of the Lane is that it is a corruption of the Middle-English word ‘Midden’, meaning a place where beasts of burden would relieve themselves. In the past, Maiden Lane had a bewitching quality which attracted the great and the good: Louis Napoleon, Benjamin Disraeli and Voltaire all lived here, the artist J.M.W. Turner was born here, Edward VII and Lily Langtry dined here, and the celebrated actor of his day, William Terriss was murdered here by a crazed understudy in 1897. Woven in to the social and socialite story of the area is the story of a continuous Catholic presence in and around Covent Garden. Open and closet Catholics abounded, including such names as St Philip Howard, the Earl of Arundel; the Jesuit missioner St Robert Southwell; Mary Ward, foundress of the ISBVM’s; St Claude la Colombiere (who introduced devotion to the Sacred Heart to England; Charles I’s architect Inigo Jones; the poet John Dryden and the composer of ‘Rule Britannia’, Thomas Arne. Side by side with the great and the good were vast numbers of poor Catholics, many of them working in Covent Garden and living mainly in Drury Lane or the slums of St Giles’, Holborn and Saffron Hill. Longstanding Irish colonies existed in all these places, and the rate of immigration accelerated strongly during the Irish Potato Famine. Before Catholic worship was made legal in 1791, Mass was celebrated for the fashionable and well-to-do in the chapels of foreign embassies, Sardinian, Bavarian, Spanish, Venetian: and for the poor, in taverns and private homes. Catholic Emancipation, when it came, was a wonderful opportunity but an almighty challenge. In 1849 the future Cardinal Newman sent Fr Faber to found the London Oratory in King William St, Charing Cross. He bought what had been a dance hall and converted it into a church, also opening a school. In 1854 the Oratorians left for the then village of Brompton in West London, leaving a gap which was not filled until 1872, when Archbishop Manning sent Fr Cornelius Keens to lease a piece of land from the Bedford Estates to build a church. A lease was granted on condition that the building would cost at least £6,000. 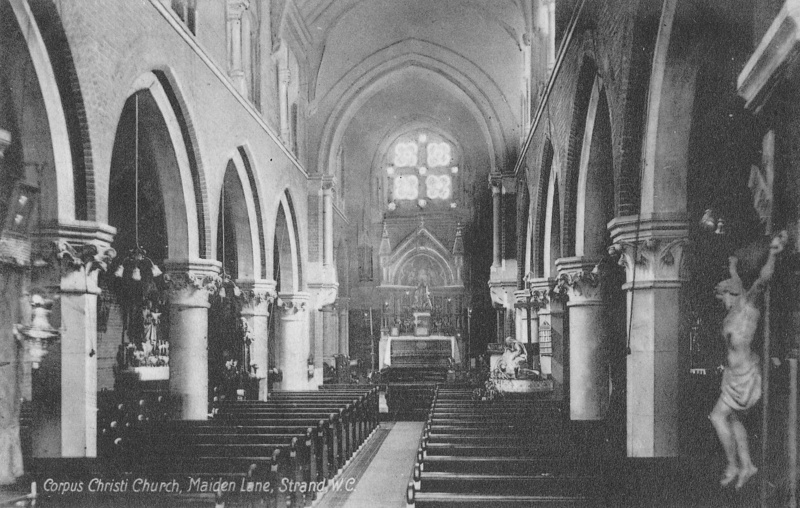 Before building commenced Fr Keens celebrated Mass in the church school, then as now in Macklin Street off Drury Lane. 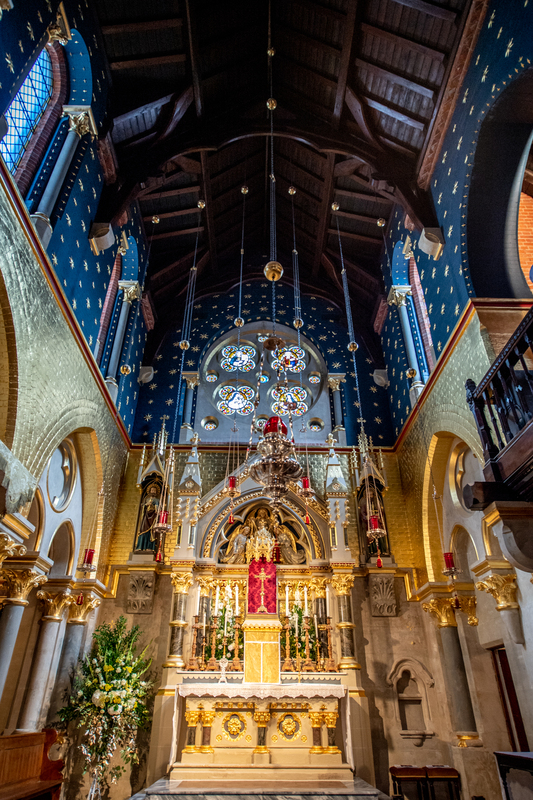 People flocked in, large numbers were brought back to the Sacraments after years of neglect, and a survey listed over 2000 Catholics in the district allocated for the new parish, covering Covent Garden, the Strand, Trafalger Square and Whitehall. The foundation stone of Corpus Christi was laid on 5th August 1873. It would be the first church in England since the Reformation to be given the dedication of Corpus Christi, and Fr Keens appealed widely for contributions towards the £8,000 cost, calling it an act of reparation ‘for the sacrileges committed at that sad time against the Divine Sacrament’. 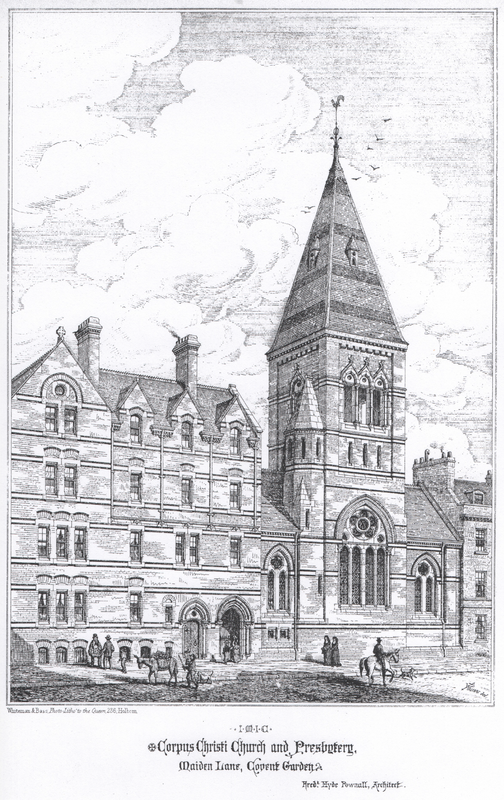 He chose the same architect, Frederick Hyde Pownall, who he had used for another of his building projects, Sacred Heart, Holloway. Pownall created Corpus Christi in the same style as the Sacred Heart, Early English. Pownall had to struggle with a cramped and awkward-shaped site, and to mollify local concerns about the proposed height of the church, he sank it three feet below the level of the pavement. The church was finally opened with a fanfare on 20th October 1874 by the Cardinal Archbishop. 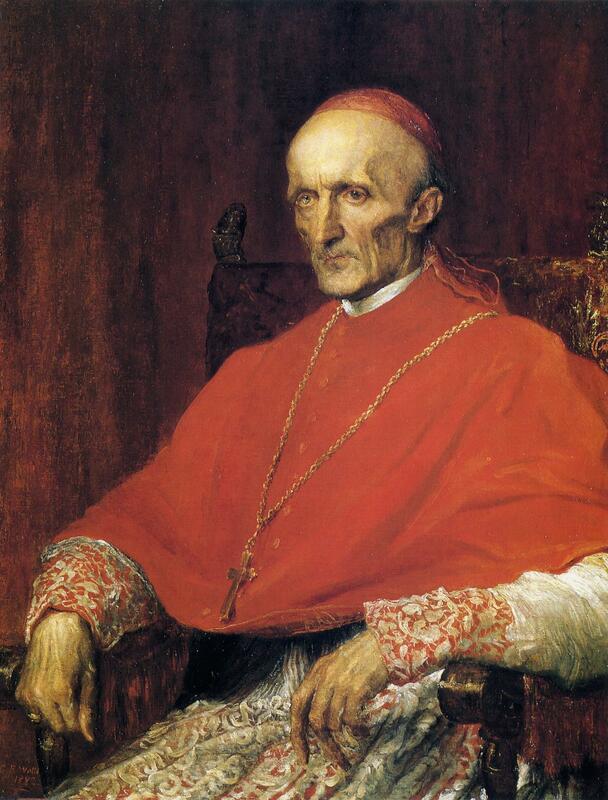 In his sermon Cardinal Manning said: “A sanctuary has been opened to be specifically devoted to the adoration of the Blessed Sacrament.” The choice of dedication was a re-affirmation of the teaching of the Church on the Real Presence of Christ in the Blessed Sacrament. Fr Francis Stanfield was parish priest here in the early 1880’s, and wrote two very famous hymns which have a great bearing on life here and are well known throughout the Catholic Church: Sweet Sacrament Divine and O Sacred Heart. Those hymns are quite a legacy, and not just for their devotional nature. They also make a connection between Corpus Christ and most of the Catholic churches in the English-speaking world. A visitor of particular note came in 1908, the year of the Eucharistic Congress in London. 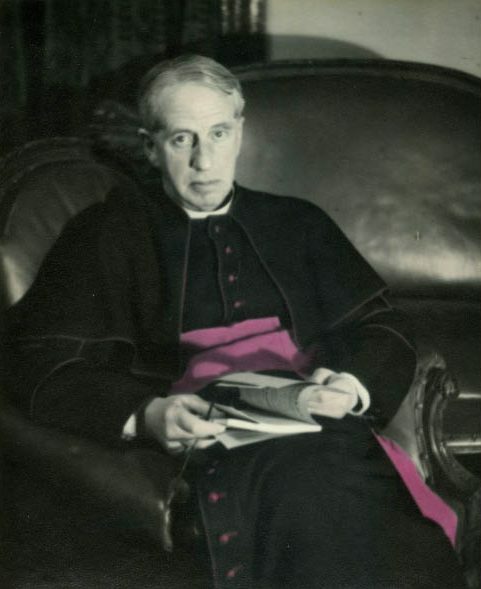 Monsignor Ronald Knox preached at the Patronal Feast that year and the invitation extended to 26 times altogether. His sermons were published in book form under the titles ‘Between Heaven and Charing Cross’ and ‘Window in the Wall’. From the official opening in 1874 it took another 82 years before the original debt could be paid off and, as a result, the church was consecrated on 18th October 1956. What immediately strikes visitors to Corpus Christi is that everything and every one of the saints points to the Real Presence of Christ in the Tabernacle, Body and Blood, Soul and Divinity. The Sanctuary has been restored to resemble the inside of a tabernacle, the gold walls signifying the majesty of the throne upon which Christ reigns over the universe. Three angels sit over the tabernacle with thuribles of burning incense, reminding us of God’s transcendence and that, in the sacrifice of the altar, heaven and earth are intrinsically linked. In the words of the Second Vatican Council, it is here that ‘we take part in a foretaste of the heavenly liturgy’ which is to come. The way the sanctuary leads our eyes to eternity reminds us that we do not come to God alone. When we approach the altar, we join ourselves with the countless angels, saints, thrones and dominions who praise and glorify God on high. It is here that the entire cosmos joins together as one in worship of God. As Cardinal Ratzinger reminds us in his book Spirit of the Liturgy, “the cosmos is not a kind of closed building” or “a stationary container” but rather a movement towards our creator. Around the church, there are statues and images of Saints who have defended and upheld the Church’s teaching of Christi’s real presence in the Blessed Sacrament: the unique little statue of St Tarcisius, the boy-martyr of the third century killed by a Roman mob while carrying Holy Communion to the sick; the statue of St Genesius, a professional actor who was martyred for the faith and is now patron saint of actors everywhere. The great east window shows four 13th-century saints of the Blessed Sacrament: St Clare of Assisi, whose prayer before the Blessed Sacrament on the walls of her convent drove off an attacking army; Blessed Juliana of Mount Cornillon, whose visions led to the institution of the Feast of Corpus Christi; and St Thomas Aquinas and St Bonaventure, who composed the first hymns for the Feast. Recent additions include St Pio of Pietrelcina, or Padre Pio, holding the Sacred Host high, as at Mass, and St Jean Vianney, or the Curé of Ars, who taught on the importance of the Mass and the Sacrament of Confession. And so it remains, over 140 years later, having been the home and place of worship for countless parishioners and pilgrims. Much has changed over the years. Corpus Christi was dreamt of and built to serve the market workers of Covent Garden, yet within a few years slum clearance drove out many of the coster families, making a significant dent in parishioner numbers. But at the same time grand hotels began to go up along the Strand, bringing in wealthy foreign tourists to swell the congregations at Mass. From the start Corpus Christi had a special outreach to theatre-land, becoming known as the Actor’s Church – a role it still serves. Huge demographic change means that very few of those who claim Corpus Christi as their church actually live locally. In what is now a largely working and leisure district, although local characters and parishioners remain. The church today has a wonderfully varied ministry of welcome, hospitality and service. From being a parish church for the resident and visitors of Covent Garden, it is also the spiritual home of the Catholic Association of Performing Arts (CaAPA), the Latin Mass Society, the London home of the Fraternity of St. Genesius and the Corpus Christi prayer group. Hundreds of people pass through our open doors each week to celebrate the Sacraments of Reconciliation and Holy Mass or simply to light a candle, soak up the stillness and find a little peace. Corpus Christi still fulfils the role for which it was built: to provide a holy place where we can meet with God and He with us and a place where Jesus Christ, truly present in the Most Blessed Sacrament is adored and glorified. 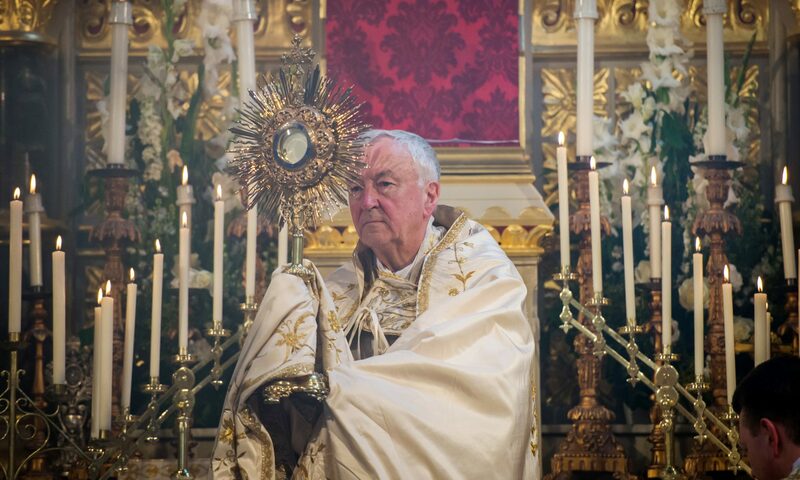 In 2018, His Eminence, Vincent Cardinal Nichols raised Corpus Christi to the dignity of the Diocesan Shrine of the Blessed Sacrament in recognition of the efforts to make this a place where Christ can be worthily honoured in the Blessed Sacrament.